Oh my goodness, if you're into nigiri (seared to be exact), there is really no other better indulgence than the seared toro (tuna belly). Every piece is deliciously thick and succulent and seared without being overdone. Despite being seared, you can still taste the freshness in the texture of the meat. Due to the size and richness of each piece, it's easy to get surprisingly full after 2-3 pieces. But in a nutshell, I could probably eat this everyday..
During our second visit to Blue Water, we also tried the Stamina Roll which probably includes more ingredients than a normal meal altogether. After eating the nigiri, I can say that it definitely takes stamina to finish this roll (haha). There are a lot of flavours going on here and at times, I felt a bit overwhelmed with the combination of the rich crab meat, smoky flavours from the fish, as well as the thick soy glaze. I wouldn't say that this blew my mind like the nigiri - I don't regret ordering it but I would probably stick to the more fresh selections on the raw bar menu for a more wow-factor. The first plate of the tasting platter definitely set the tone for the tower as its citrus-y, light, and fresh flavours lifted the natural flavours of the scallop. I'd like to point out the toasted nuts which were a great compliment to the soft texture of the seafood. However during our second visit, we found that the onions overwhelmed the dish a bit. Probably my least favourite dish of the tower only due to the fact that I'm not a fan of the daikon that sandwiched the amazingly rich layer of seafood. I assume the nuts on the plate were pine nuts but they added a nice little crunch to the crab and baby shrimps. Wow is all I can say about this plate. The salty, crisp baked seaweed chip goes hand in hand with the hearty and well flavoured albacore tuna tartare on top. Every bite comes with a generous amount of tuna that melts in your mouth and a lovely crunch from the seaweed chip. Someone please feed me this everyday. Upon first glance, I was really iffy about how this dish would taste but wow was I on for a surprise. This salmon dish looks like a cake...and could probably be classified as one too,because if there was such thing as a salmon cake, this would be it. Slices of smoked salmon are alternately layered with terrine and create an amazingly creamy texture with a smoky taste. I loved pairing this with the coffee crumble and nuts on the side for an extra dimension of texture. I absolutely loved the seafood tasting tower (despite not fully loving the second dish). It feels almost like a full course meal in itself: the ceviche being the appetizer, crab and shrimp sandwich being a light meal starter, the tuna tartare being the main course, and the smoked salmon terrine being the dessert. If you're not ready to splurge too much at Blue Water, I would recommend going for this tower along with a choice from the raw bar menu. This is hands down the best sablefish I have ever had to date... and I don't say that lightly. There are just so many things that go right with this dish - from the tender juiciness of the sablefish, to the nice crunch of the bok choy, to the absolutely mouthwatering mushroom yuzu dashi. Both times that I ordered this, I found myself just smelling the broth for a good 5 minutes before actually digging in. There isn't a trace of dryness in the fish meat and I find it to contain the perfect amount of flavour. I love how this dish is still light despite being a very filling main course. Basically speaking, this dish has a very special place in my heart. 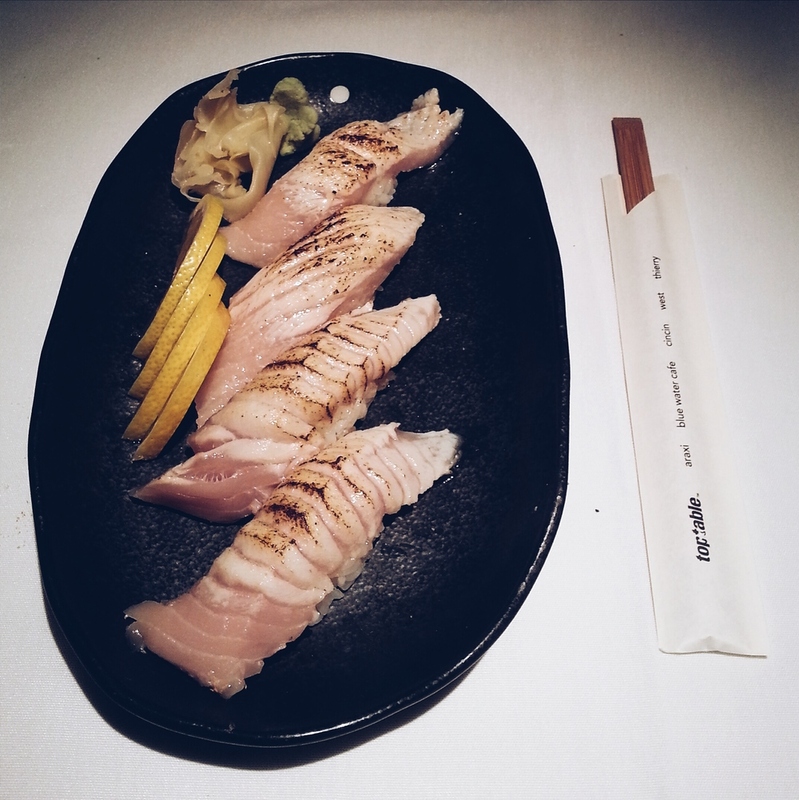 The sturgeon, unlike the sablefish is a much dryer "sea" principle plate that Blue Water has to offer which is understandable due to the lack of broth. However, I found the fish to be a bit too well done for my liking - the meat didn't just fall off like the sablefish. The flavours on this plate are much stronger from the pumpernickel crush and puree on the plate but are balanced nicely with the sauteed vegetables and beets underneath. 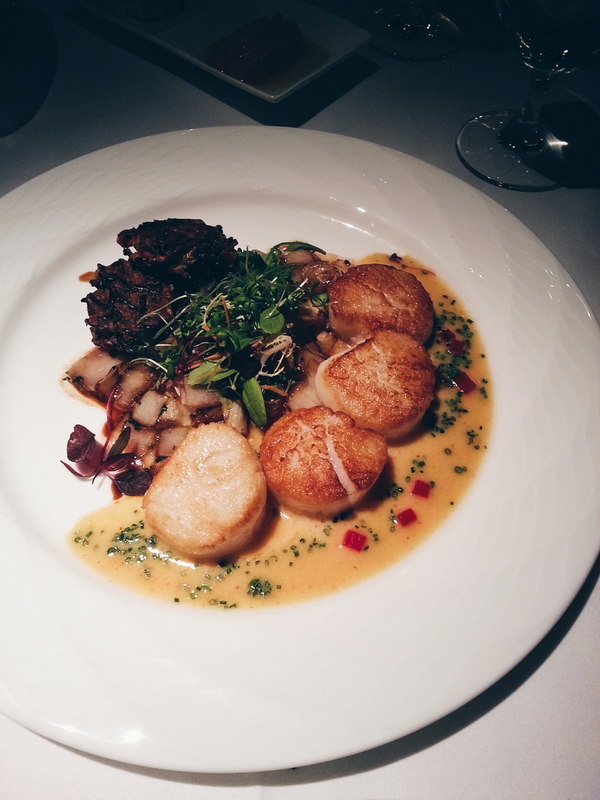 If you're a scallop lover, this is probably the dish for you (..if you're not already ordering the sablefish haha). The scallops are so juicy and fat and go together lovely with the slightly thick citrus sauce. I found the griddle cake salad side and to be okay, nothing too great. Once again, I found there too be too many onions for my liking so most of them were left on the plate. Out of the three principle plates we tried, I would say this is the least filling. Out of pure spontaneity, we ordered two scallop accompaniments and were delightfully surprised with what we were presented with. 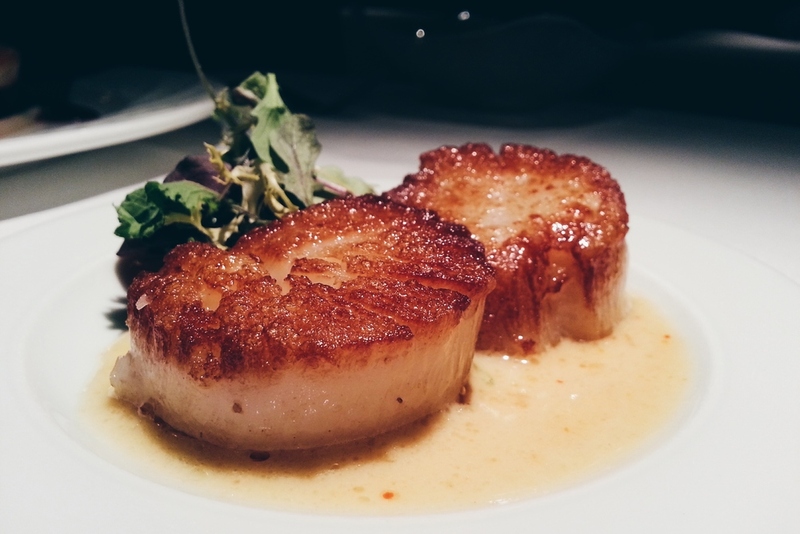 At a hefty $6.50 per scallop, I'm glad the scallops tasted as good as they were. A lovely thin crust sandwiches a lovely juicy and thick layer of perfectly cooked scallop. Paired with a creamy sauce, this makes for one of the best indulgences. Honestly, I thought these scallops were done better than the scallops in the scallop principle plate.